The talent show format seeps into yet another unlikely area to produce “winners” of extraordinary opportunities to perform. 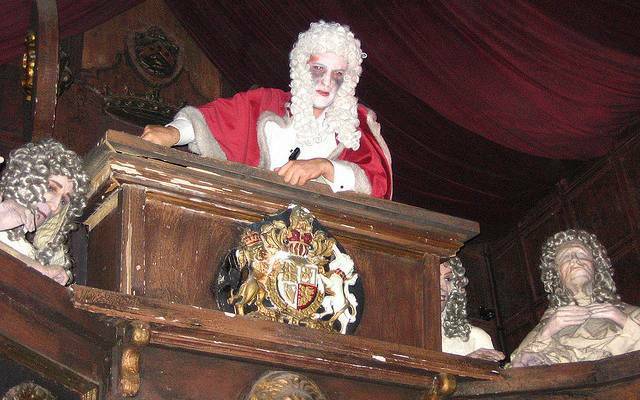 This time, the king of runny eye make-up Alice Cooper played judge at an event to find Rock’s Next Top Shock Support Stunt Act. Extreme stage acts involving fire, nails, chains, needles, fake blood, decapitated teddy bears and live snakes all did their best to impress shock rocker Alice Cooper at the talent-spotting event held in the charming surroundings of the London Dungeon. The aim was to impress Cooper and be selected as one of four chosen acts joining him on stage at the Roundhouse for his Halloween Night of Fear gigs scheduled for 31 October and 1 November. And who impressed him enough to win those coveted slots? The paraphrased maxim “no pain, no fame” applies rather aptly; the needle-phobic Cooper seemed particularly impressed by acts involving pins, piercings and punctures so he chose a ballet dancer who pins feathers to her body, then pierces her cheeks with roses. Another chosen act lifts barrels with safety pins in his arms. How these performers came to realise their skills is a mystery - a crisis at the brewery requiring one man to lift several casks of real ale onto the delivery truck using nothing but safety pins? A terrible accident at the end of a ballet recital when roses thrown on stage went through a dancer’s face? However these acts came about, they’ll be on stage with Alice Cooper at the Roundhouse in a few months’ time, adding a little homegrown gory sparkle to his grotesque kitsch-fest. Until then, we wish the London Dungeons the best of luck in removing all the melted wax, fake blood, snake pellets and failed contestants still chained to exhibits.